Gosling’s rum was flowing as much as the speeches were glowing as Waterloo House had its official roof wetting ceremony. 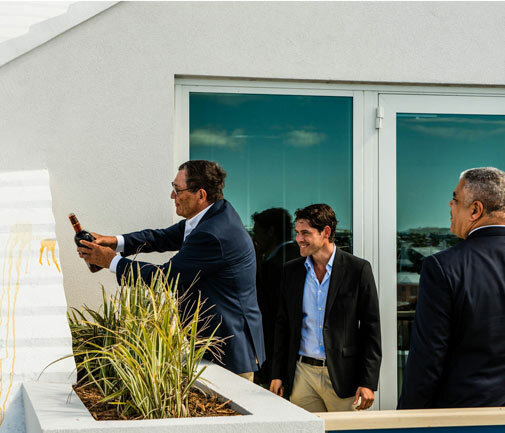 Premier Craig Cannonier harkened it as a “new day for Bermuda” and thanked the Green family for their investment in the property. The Greens, who a day earlier had announced a $70 million upgrade for the Fairmont Hamilton Princess — which they also own — had praise rained down on them from Government and construction community for believing in Bermuda. Alexander Green, speaking on behalf of his father Peter and brother Andrew, told a crowd of more than 75 people gathered on the roof of Waterloo House that it has been a very “rewarding project” for his family. “We’ve enjoyed watching this new addition go up in west Hamilton. Mr Green said 90 per cent of the office space in Waterloo House as been snapped up by the likes of some of the pillars of the international business community as Arch, Contraruis, Endurance and Platinum will take up residence in the new building. There are also several luxury apartments available, which are being handled by rego Sotheby’s International Realty. He also thanked the Government — the project first started 28 months ago under the PLP — for its help in ensuring the new Waterloo House was built. Premier Craig Cannonier was enthusiastic in his support. He said: “I really can’t say enough of what today really means to Bermuda. It marks a new day. It will go down in history as a time when we turned the curve of some of the economic challenges as it has. “It marks a time when we have come together — when you come together, the result is innovation, the result is a future that we can see. It will go down in the history of time as one of those occasions that we truly put aside our differences to make things happen. Mr Wood said the first inhabitants will move into Waterloo House in September.